Be sure to read our blog on Flue Gas Temperatures and PVC Venting. Bosch has announced the addition of six new ultra efficient wall mounted condensing boilers to its Thermotechnology line of products. Bosch Greenstar gas-fired condensing boilers can offer efficiency levels of up to 98.7 percent, turning 98.7 percent of the fuel used into heat – a significant upgrade compared to traditional or non-condensing boilers. The Bosch Greenstar™ series, available in configurations ranging from 57.2 to 151.6 MBH, utilize condensing technology – an invention where the latent heat in the unit’s exhaust gases is extracted and re-used – a highly efficient use of energy which also significantly reduces carbon dioxide emissions into the atmosphere. Viessmann’s latest gas-fired condensing boiler is unlike any other condensing boiler system. TJ’s has seen, first hand, just how this boiler operates, and what makes it so special. High efficiency of 95% AFUE on all models. High temperature operation of up to 90°C (194°F). Inox-Crossal heat transfer surface – 316Ti stainless steel heat exchanger for efficient utilization of condensing technology – self-cleaning effect via smooth stainless steel surfaces. Vitocrossal Pocket Design with wide water passage ways allow for system/full flow applications. No dedicated boiler pump required and eliminates primary/secondary piping. Multi-venting options and configurations with vent lengths up to 198 ft. The perfect mix of performance, quality and value, the Vitodens 100-W gas-fired wall-mount condensing boiler is ideal for any home and any budget. 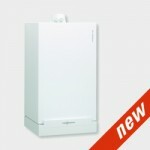 With added product features, the new generation of this popular boiler now offers even greater versatility and choice. Outstanding Efficiency of 95.2% A.F.U.E. on all models. With the new Vitodens 100 CombiPLUS Package add on-demand domestic hot water (DHW) to your new Vitodens 100 space heating boiler and say goodbye to your DHW tank. Enjoy DHW at the snap of your fingers all day long with an outstanding flow rate of up to 3.6 GPM†, plus added cost savings with the energy-efficient on-demand indirect-fired design. Slightly bigger than a large shoe box, the CombiPLUS Kit installs underneath or beside the boiler and requires only minimal piping and electrical connections. Equipped with a stainless steel heat exchanger, built-in pressure bypass, DHW temperature and fl ow sensors, 3-speed pump and 3-way diverting valve, get nothing but reliable, high-quality DHW day after day. 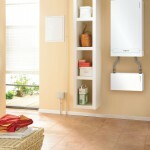 All the benefits of a Vitodens 100 boiler, plus on-demand domestic hot water (DHW) with CombiPLUS Kit. DHW at the snap of your fingers all day long! Up to 3.6 GPM. Energy-efficient and low-cost due to on-demand indirect-fired DHW production. Reduced energy waste with fully-modulating input from boiler. Space-saving and lightweight wall-mount design. More compact than any other hot water heater. Easy installation with all piping and electrical connections included. Quality you can count on! Stainless steel heat exchanger, built-in pressure bypass and 150 psig working pressure rating. Reliable and even DHW supply with built-in DHW temperature and flow sensors. 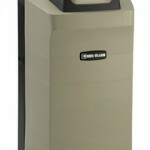 Complete space / DHW heating management by boiler control, powerful built-in 3-speed pump and diverting valve. Great fit for apartments, condos, cottages, single-family homes, or installs where space is at a premium. Equipped with the industry’s first intelligent combustion management system and powerful control technology, the new generation Vitodens 200-W gas-fired wall-mount condensing boiler delivers unparalleled performance, reliability and comfort. Highest Efficiency of up to 98% at full modulation and up to 96.1% A.F.U.E. CSA thermal efficiency to ANSI Z.21.13/CSA 4.9 of 94.5% (for model WB2B 105 only). Fast Installation and Reduced Maintenance with Lambda Pro, industry-first intelligent combustion management system. Adjusts automatically to gas type and quality. No fuel conversion kit required. Powerful and User-Friendly Viessmann Vitotronic on-board multifunction outdoor reset boiler and system control for multi-temperature space and DHW heating. Expanded Application Range with increased capacity up to 370 MBH. Multi-boiler installation up to 1480 MBH with up to 4 boilers (models WB2B 45 and up). Greater Venting Flexibility with increased vent length (up to 180’) and multiple venting options. True High-Altitude Operation up to 10,000 ft / 3,000 m with simple electronic adjustment. The KNIGHT’s unique SMART SYSTEM™ Control includes an energy-saving setback function that lets you custom-tailor the boiler’s performance to your comfort needs. It also features a 2-line LCD display that alerts you when servicing is required. And as the outside t e m p e r a t u r e changes, the automatic energy monitor adjusts the KNIGHT’s output for maximum comfort and energy savings. Weil-McLain’s Ultra Series 3-UE delivers peace of mind, unmatched comfort and immediate payback in energy savings. 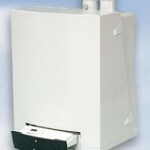 Mascot is a high-efficiency, wall-mounted boiler available in three BTU sizes –126, 167, and 242 MBTU. The two 126 MBTU boilers are considered residential and they are available both as “heating only” boilers (model HT 1.330) and as “combi” boilers with both hydronic heating and domestic hot water (model HT 330). The Mascot 167 & 242 MBTU boilers (HT 1.450 & HT 1.650) are packaged differently for potential commercial applications using either single or multiple boiler installations. This means that customers may order single or multiple piping assemblies, and single or multiple venting systems with the HT 1.450 & HT 1.650. The Munchkin Boiler is one of the most compact and efficient residential boiler available on the market today. Each Munchkin Boiler will modulate its firing rate to match the energy needs of the living space. This feature provides additional savings versus traditional single firing heaters. With stainless steel construction, you can be assured that you are buying the highest quality appliance. Proven European technology, manufactured in the United States. 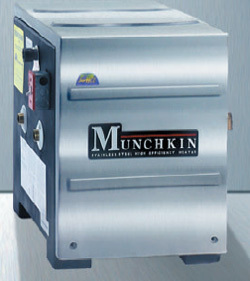 A quiet operational appliance is just another benefit that comes with the Munchkin boiler.